Bike Travel Weekend is an annual celebration of travel by bicycle. Thousands of people worldwide do an overnight bicycle trip on the first weekend in June. I convinced a couple of friends to join me this year for a multi-modal cycling adventure. 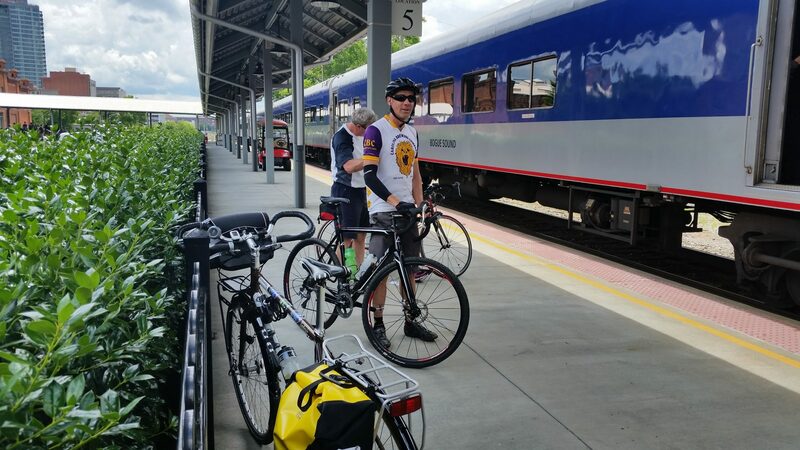 We planned to take our bikes on the train to Durham, NC and then follow 75 miles of the East Coast Greenway (ECG) route to Clayton, NC. Almost any bike trip counts for Bike Travel Weekend as long as you’re spending a night somewhere other than in your own bed. You can ride to a friend’s house, a campground, or even a hotel. The goal is simply to inspire people to travel by bicycle! The Adventure Cycling Association (ACA) held the first Bike Travel Weekend event in 2016 to commemorate the 40th anniversary of Bikecentennial. Bikecentennial was a summer-long event in 1976 that motivated thousands of people to bike across the United States. Bikecentennial then evolved from an event to the first of many permanent bike routes across the country to the premier bicycle-travel membership organization in North America. The ACA now has more than 53,000 members and a network of more than 46,000 miles of bike routes. Their mission is to inspire and empower people to travel by bicycle. The ACA has definitely inspired me and fueled my desire to travel under my own pedal power. My first big ride was CycleNC‘s Mountains to Coast ride in 2013. The next year I organized a supported ride for a group of friends. On our ‘Top Down Tour’, we rode from the summit of Mt. Mitchell (highest point in NC) to the Atlantic Ocean (sea level) at Wrightsville Beach, NC. If the idea of bicycle travel interests you at all, request a free copy of their Adventure Cyclist magazine. Each issue is chock full of inspiring stories and pictures! The ECG route connects 15 states, 450 cities and towns, and 3,000 miles of people-powered trails from Maine to Florida. It is the country’s longest biking and walking route. 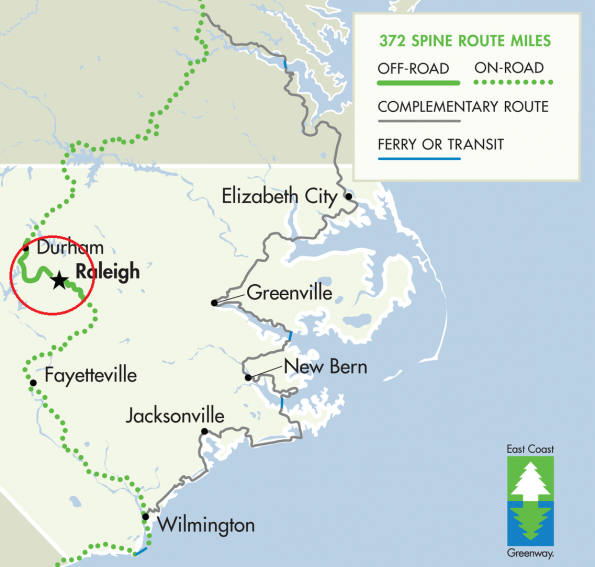 The non-profit East Coast Greenway Alliance, with offices located in Durham, coordinates with the numerous agencies working to support the route. About 32% of the route now follows protected pathways separated from vehicle traffic. 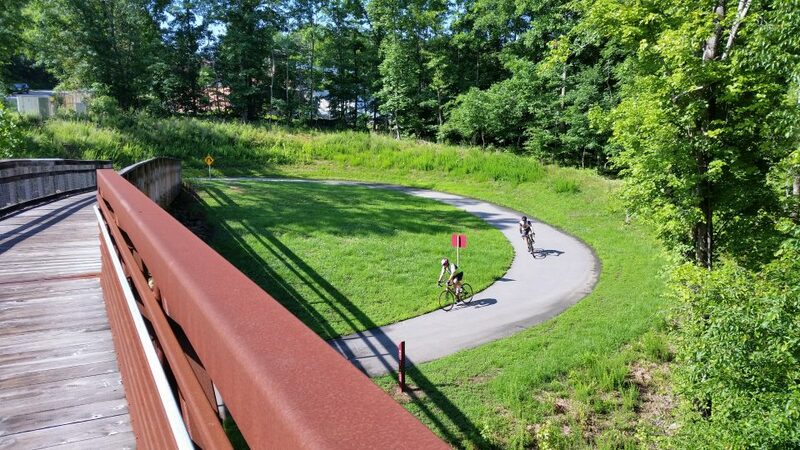 Did you know efforts to complete this greenway have been underway since 1991? Nearly all of the ECG route on our trip would be on protected greenways and trails. We could have ridden those 75 miles in a single day, but spending the night near downtown Raleigh would allow us more time to enjoy stops along the way. After all, that is the key difference between bicycle touring and biking for exercise or for racing! Since I was exploring multi-modal travel on this trip, I made a last minute decision to take a Town of Cary bus from my neighborhood to the downtown train station. That reduced my pre-train-ride biking from five miles to one mile and only cost me $1.50. It also helped me delay the inevitable full-on summertime sweat. 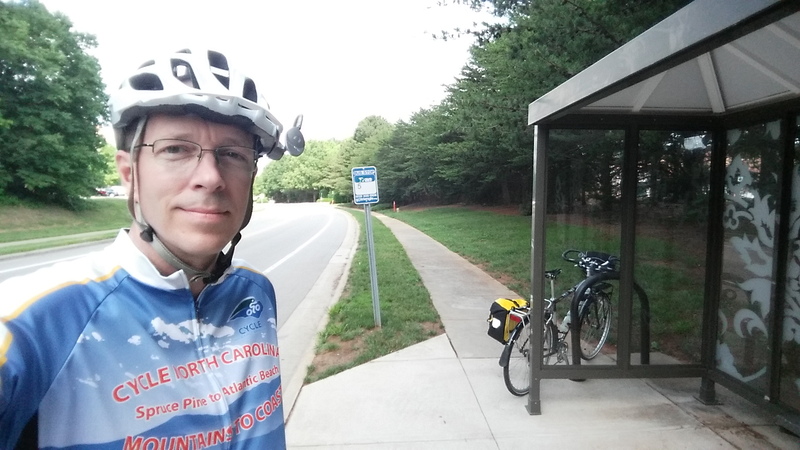 Bob biked the nine miles from his house in Raleigh to the Cary train station. I saw him relaxing on a park bench as my bus pulled into the downtown area. We were both a little early and had to wait until Lee arrived on the train from Raleigh. He had only biked two miles across downtown Raleigh before boarding the train there. I don’t remember the last time I rode a train, and never have with a bike. A train ticket from Cary to Durham on the Amtrak Piedmont cost a whopping $6.50. 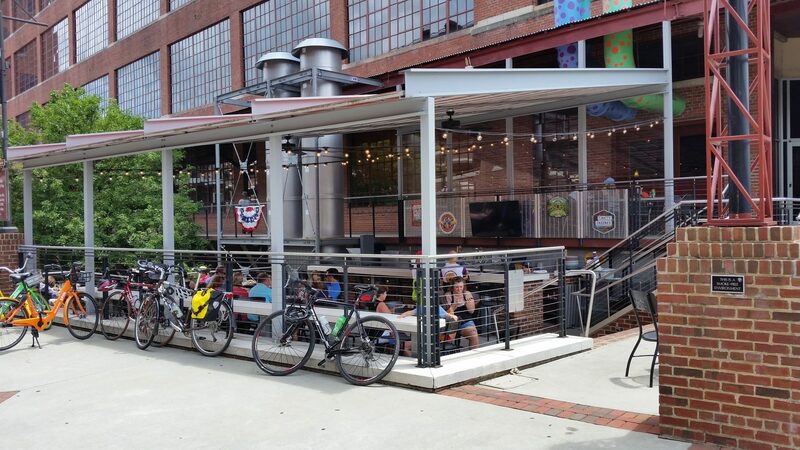 There’s no extra charge for your bike if you’re riding between any stations between Raleigh and Charlotte, but the train is only equipped to carry six roll-on bikes, so reservations are required. The train ride was quite pleasant. The seats were comfortable and had more room than first class seating on an airplane. Seeing the landscape pass by from the train was an interesting reversal of perspective. The ride was quick – just under 20 minutes, and much faster than I could have biked to Durham! Our first order of business in Durham was to grab lunch. Bob and Lee used to get a pepperoni and pepperoncini pizza at Mellow Mushroom back in their volleyball days. It didn’t take much talk about pizza to start my stomach growling and get me on board for one of those! 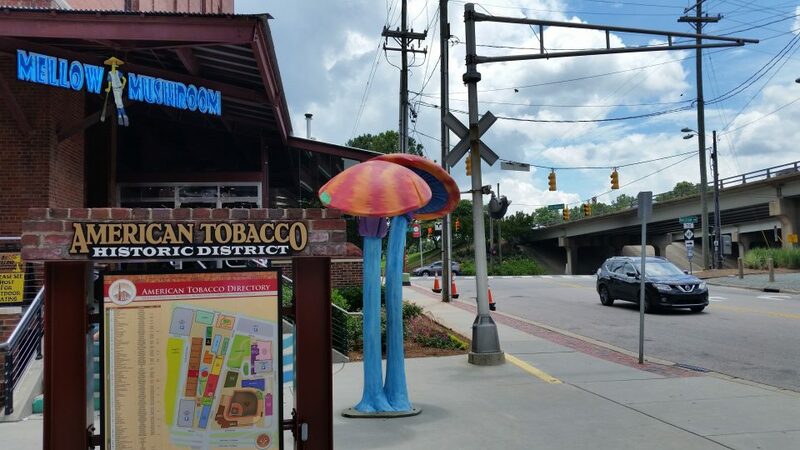 Mellow Mushroom is located right on the ECG route. We only had to ride two blocks over and two blocks down to get there from the train station. We sat outside and enjoyed our pizza, watching kids stream in and out from a baseball camp event at the Durham Bulls Athletic Park across the street and lots of people strolling through the American Tobacco Campus. Across the street to the south is Mile 0.00 of the American Tobacco Trail rail-trail (ATT), which the ECG route follows for 17.6 miles. Solite Park is located on Fayetteville Road, right beside the ATT/ECG route. This small park includes a short ‘gateway’ mountain bike trail built by our regional bike club, the Triangle Off-Road Cyclists (TORC). 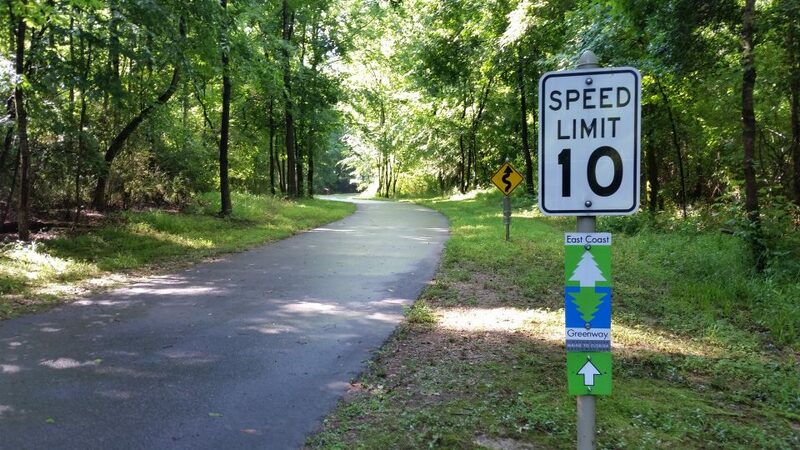 This trail is included in Oak City Cycling Project‘s Tetractus Challenge that I recently posted about. We opted not to ride the trail this time. The East Coast Greenway Alliance home office is right off the greenway about a mile and a half south of Solite park. A short unmarked sidewalk connects the greenway to their office building parking lot. If it had not been a Saturday when we passed by, we would have stopped in to thank them for their efforts in making the ECG a reality! From an urban setting on the north end, the ATT gradually gets more and more rural and remote. 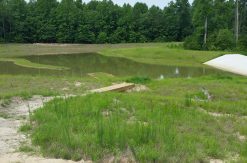 The path itself changes from all asphalt pavement in Durham County to a split pavement and fine gravel section in Chatham County (to accommodate horseback riders), to all fine gravel in Wake County’s section. The Cloer Family Vineyards are located less than a half mile west of where the ECG crosses Green Level West Road. They host an annual bike & wine tasting lunch event for the ECGA. 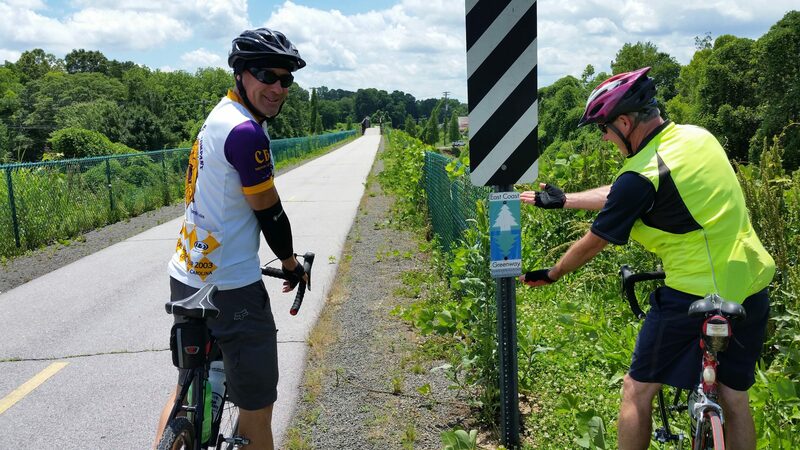 Participants ride the Tobacco Trail down from Durham, enjoy a few hours at the vineyard, and then bike back to Durham. 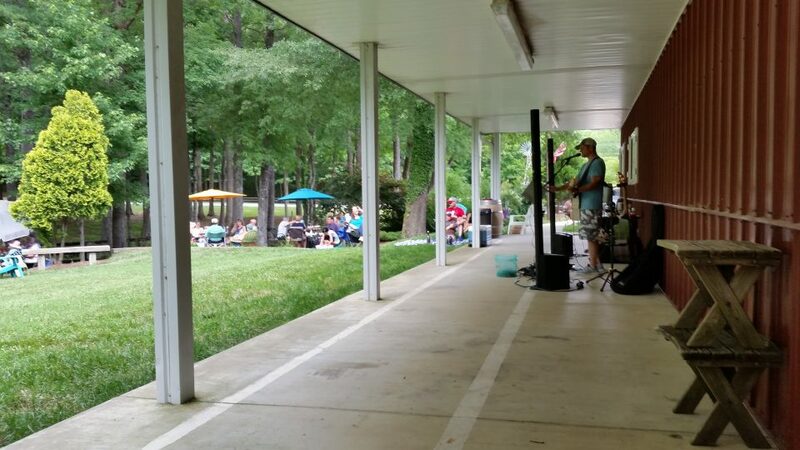 One of Cloer’s summer Saturday afternoon music events was underway when we arrived! We enjoyed a few wine tastings and listened to live music while we sat in the shade for a while. Back on our bikes, we returned to the Green Level West Road and ECG crossing. The ECG route leaves the Tobacco Trail at this crossing and heads east along the road for about a mile before connecting to the Town of Cary’s White Oak Greenway. Construction of a greenway connection to close this short gap is already underway. At Davis Drive, another gap exists where the greenway route follows sidewalks to get across some railroad tracks and around a small neighborhood. A project is in the works to close this gap too. The White Oak Greenway then led us to Cary’s Bond Park, where the ECG route continues onto the Black Creek Greenway, Cary’s longest. The stretch of the ECG that parallels Maynard Road offers plenty of places to stop for refreshments. One of my favorite places is Great Harvest Bread Company. 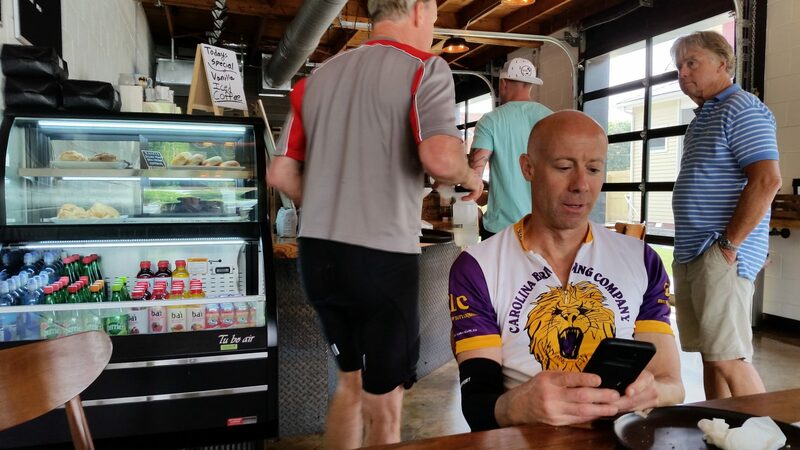 Not only do they give free samples of their delicious pastries and breads, but the owners are cyclists too. Tom rides his bike to work almost every morning. I hear traffic is pretty light at 4 am! Cheddar Garlic bread was on the sample tray but the counter girl said we could sample anything on the fresh goods rack. We sampled the bread, bought a strawberry scone to split, and then I bought a loaf of the Cheddar Garlic bread to go with our dinner that night. Yay for panniers! When we stepped back outside, a roll of thunder and dark skies greeted us. The next part of our ride could get interesting! The Black Creek Greenway led us across Cary, by Lake Crabtree, and ended at the edge of Umstead State Park. We saw increasing signs of recent raindrops on the ground, but nothing was falling on us. By the time we reached the state park, we were even seeing a few puddles on the ground. The 5-mile stretch of ECG through Umstead is graveled, but the fine-screened gravel mix they use is relatively smooth to ride. A little patience, tolerance, and care should get anyone through this section on any bike. The surface was a little soft after the rain, but not enough to cause us problems. We had just missed the rain shower, but the visible steam in the air left no doubt we were at maximum humidity. After passing through Umstead, the ECG route skirts the edge of the North Carolina Art Museum‘s outdoor exhibit space. 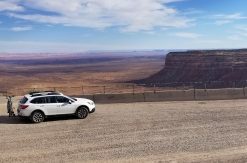 Taking time to appreciate the displays can make for a fun stop. At this point in our day, our art appreciation capacity was running low. Using several different local greenways, we followed the ECG route through the campuses of Meredith College and North Carolina State University (go Pack!). Near downtown Raleigh, the ECG route leaves greenways and follows streets through the heart of downtown. As we rode up Boylan Avenue and approached its iconic bridge with an awesome view of the downtown skyline, we found a line of stopped vehicles. 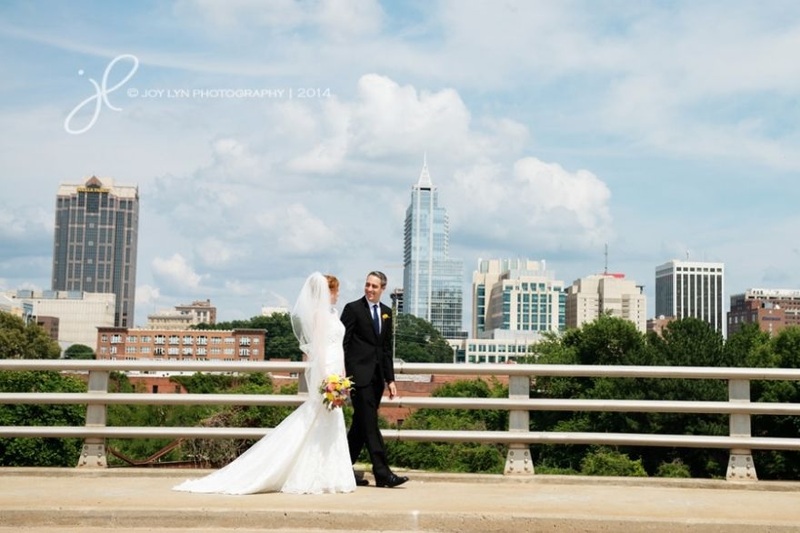 We soon realized a wedding party had stopped traffic on the bridge for a few scenic photos. They were still standing on the sidewalk as we rode by. Bridesmaids in fancy dresses were hollering and hanging out the windows of the party bus. The groom was almost close enough to get a sweaty high five from me as I rode by. In hindsight, I should have stopped the guys and taken a picture of us on bikes with the bride and groom. Three demerits for missing that photo-journalism moment! A picture like the one I should have taken! We had planned to stop at Trophy Brewing’s restaurant for a late afternoon snack, but they were packed when we arrived. There were no seats inside or out, so we decided to just head to Lee’s house, our destination for the night. When we got there, I had biked just over 53 miles. 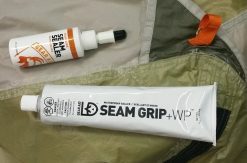 I enjoy tent camping by bicycle, but it is also nice to have a hose for the bikes, showers for us, laundry for our clothes, and a real bed for the night. A dinner of ribs on the grill, corn on the cob, watermelon, and cheddar garlic bread would have been hard to pack in panniers. The second storm of the day poured down outside as we ate. This storm would have soaked us if we’d been camping. With full bellies and tired legs, we did not feel the need to stay up late! The United Nations recently designated June 3 as the inaugural World Bicycle Day. This first-ever celebration included an assortment of special events – including all types of bike rides, all around the world. We celebrated by getting back on our bikes for the second day of our Bike Travel Weekend trip. Riding through downtown Raleigh on Sunday morning was nice. The sky was blue, the traffic was almost non-existent, and our route back to the ECG was mostly downhill. We rejoined the route at the north end of the Little Rock Trail greenway and followed it southward to the Walnut Creek Trail greenway. We have biked the stretch of ECG route along Walnut Creek Trail and then south along the Neuse River Trail many times before. There are fewer places to stop along this section. The tradeoff is an opportunity to enjoy miles of rural, riverine scenery on a paved greenway. 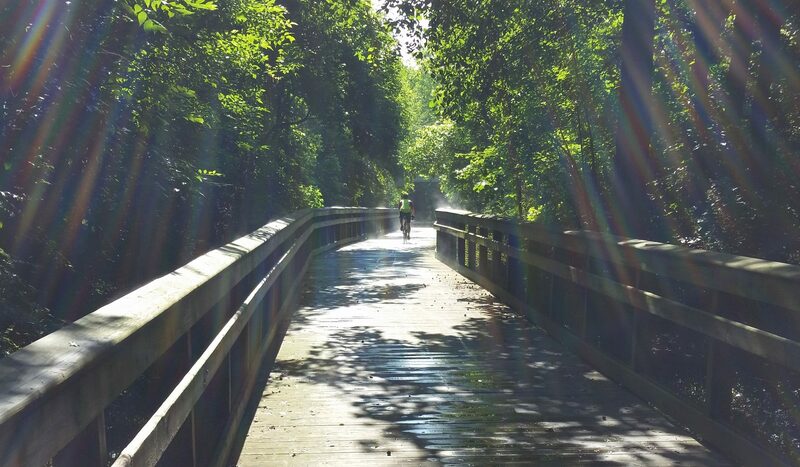 The Neuse River Trail ends where the greenway turns onto the Sam’s Branch Greenway. Sam’s Branch leads to within a mile and half of downtown Clayton. From there you have to climb a sizeable hill, on a public road, to get into town. It’s penance for all the downstream riding you just did along the river. When we reached Main Street, we achieved our main goal of following the East Coast Greenway route from Durham to Clayton. The ECG route turns left here and mostly follows roads to the South Carolina line and beyond. I’ll come back another day to ride that section. Maybe I’ll even follow it all the way to Key West. Even though that goal was complete, we were still a long way from home and hungry. We asked two people walking by if they knew of a good place to have lunch. Of course, the people we asked were visiting from New York and were less familiar with Clayton than we were, but they said the coffee shop right beside us was good. We parked our bikes and walked in to see if they had sandwiches too. We were happy to discover they had sandwiches and air conditioning! I had the Best Pimento Cheese Sandwich Evah, according to the menu. I admit it was pretty tasty. This place was so new they didn’t even have a sign up yet. I looked on Google Maps and learned we were at Boulevard West. Their Boulevard East location is on the other side of Clayton. If you know how small Clayton is, you’ll see some humor in the use of ‘boulevard’ and having coffee shops on both sides of town. After eating and cooling off a little more, we rode up Main Street. Deep River Brewing Company just happened to be having a food truck rodeo. 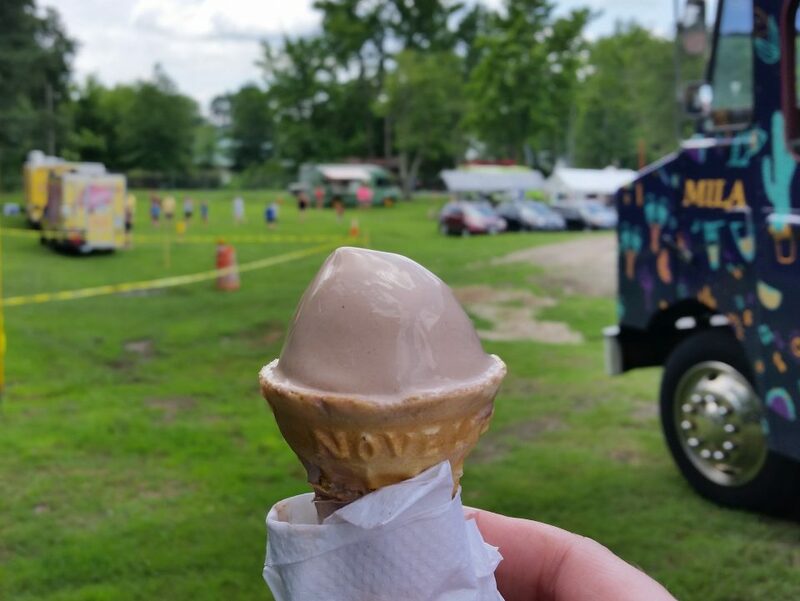 We had already eaten lunch, but a classic chocolate cone from the ice cream truck was pretty cool! Day Two of a cycling trip is always rough. The excitement of day one is gone. Your body is sore and still adjusting to this new level of activity. Days Three and beyond are much better. Whoever designed weekends to be a two-day event did not take this into consideration. Or maybe they did and it’s part of a sadistic plan to make you want to quit weekending and go back to work. With our primary goal accomplished and our bellies full, our focus turned to getting back home. We took a shortcut out of Clayton using Shotwell Road to get back to the Neuse River Trail instead of backtracking the way we entered. This saved us a few miles. From there it was a hot and humid ride back to Raleigh. Lee split off when we reached the turn for Little Rock Trail. He just had to ride two miles across downtown Raleigh to get home. Bob split off when he and I reached Rocky Branch Trail. He had about ten miles to go, including the hilly gravel trails in Umstead State Park. That left me with about ten miles to go across the south side of Raleigh and into Cary. I followed the Walnut Creek Trail for about half that distance before I left the greenway and got on roads. I could have stayed on greenways a few more miles, but I knew those were quite bumpy with roots and usually crowded. I’ve spun through that section before when I was near the end of a long ride and low on energy and patience. I knew I’d be better off just heading for a sidewalk and taking a more direct route home. When I finally pulled into my driveway I had ridden just over 55 miles for the day, giving me a total of 109 miles for the trip. Most of our plans worked out well, especially the timing of the two storms. I am now experienced with taking a bike on a bus and a train. I think those modes of transportation will find their way into my future adventures somehow. We did more than just ride, enjoying several stops as we toured. I consider our 2018 Bike Travel Weekend a success! If you have any questions about the East Coast Greenway route through the Triangle or any aspect of our trip, please let me know. I’ll be happy to help if I can! 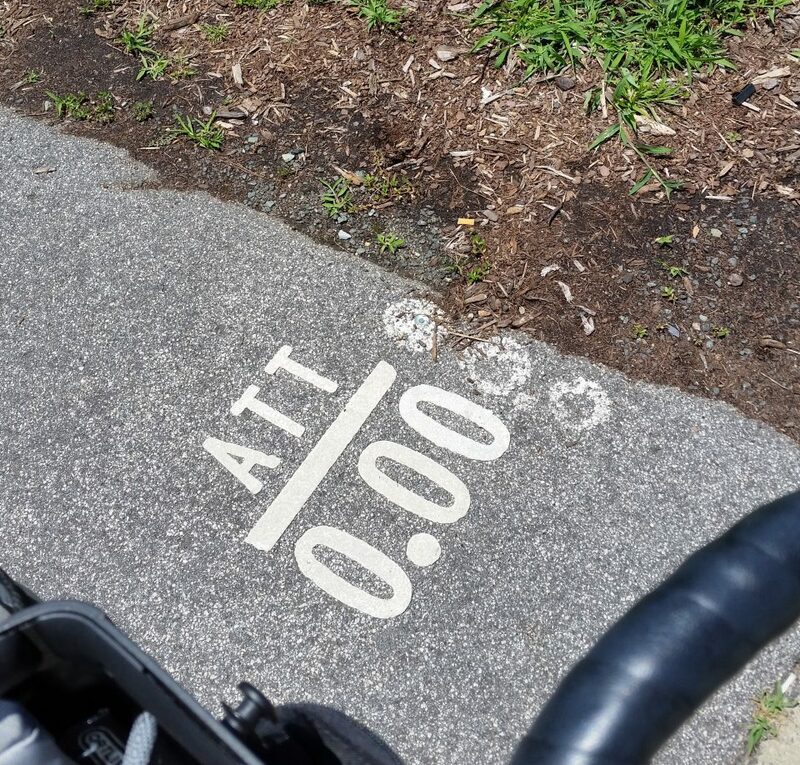 There are plenty of ways to create smaller loop rides using the many greenways in the Triangle. Bicycle travel does not have to mean riding on roads with cars! Below are route maps for the two days of our trip. You can zoom in and/or change the map layers to see other information. The ECG route is marked on the ‘OSM Cycle’ map layer. This Day One route is one-way, starting at the Durham Train Station and ending in downtown Raleigh. This Day Two route is an out-and-back starting in downtown Raleigh, going to Clayton where the ECG heads south, and then returning to downtown Raleigh. Hi Don, I enjoyed your story! May I share it on my Triangle Greenways Council Facebook site (a non-profit group supporting area greenways) ? Absolutely! The greenway and bike lane systems in the Triangle are fantastic resources. Thanks!